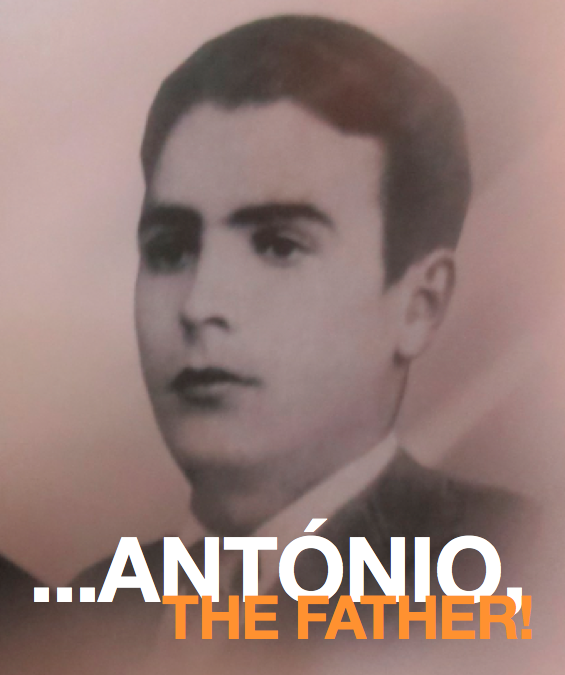 Antonio, the Father!! – Tony Borie – "Pieces of my life"
… por altura da primeira guerra mundial, onde não havia paz, o nosso Avô Geraldo, nasceu em França, na parte norte da região dos Pirinéus, a Avó Maria, na região de Navarra, em Espanha, eram tempos de guerra, mais de setenta milhões de militares, incluindo sessenta milhões de Europeus, foram mobilizados para uma das maiores guerras da história. Frentes de batalha abriram-se por quase toda a Europa, mais de nove milhões de combatentes foram mortos, em grande parte por causa de alguns avanços tecnológicos, sobretudo em armamento e estratégica de combate militar. Foi o sexto conflito mais mortal na história da humanidade e, posteriormente abriu caminho para várias mudanças políticas, como revoluções em muitas das nações envolvidas, como tal, houve deslocações de milhares de pessoas que, entre outras razões, fugiam deste maldito conflito, na procura de alguma paz e sobrevivência!. (by the time of the First World War, where there was no peace, our Grandfather Geraldo was born in France, in the northern part of the Pyrenees region, the Maria Grandmother, in the Navarra region of Spain, were times of war, of seventy million military personnel, including sixty million Europeans, have been mobilized for one of the greatest wars in history. Battle fronts have been opened across most of Europe, more than nine million combatants have been killed, largely because of some technological advances, especially in armamemt and strategic military combat. It was the sixth most deadly conflict in the history of mankind and later paved the way for a number of political changes, such as revolutions in many of the nations involved, as such, there were displacements of thousands of people who, among other reasons, fled from this cursed conflict, of some peace and survival)!. …estas são as origens dos nossos Avós Paternos, Geraldo e Maria, que percorrendo os caminhos rurais da Península Ibérica, caminhando, com centenas de outros refugiados, seguiam em direcção ao sul, numa aventura forçada, espoliados de tudo, mas dentro da sua sacola, onde traziam alguns haveres que lhes restaram, tanto o Avô Geraldo como a Avó Maria, eram portadores de duas coisas, que ninguém, nem nenhum conflito lhes conseguiu roubar, eram, “A ESPERANÇA E A FORÇA DE VIVER”!. (these are the origins of our Paternal Grandparents, Geraldo and Maria, who, traveling along the rural roads of the Iberian Peninsula, walking with hundreds of other refugees, headed southwards in a forced adventure, plundered by everything but inside their bag, where they carried some of their remaining assets, both Grandfather Geraldo and Grandmother Maria, were carriers of two things that no one, nor any conflict could steal, were “HOPE AND THE STRENGTH TO LIVE”! …conheceram-se numa aldeia, ainda em Espanha, num desses acampamentos de refugiados e, caminhando de aldeia em aldeia, pela estrada de São Tiago, vieram parar a Portugal e, gostando um do outro, casaram, onde viveram alguns anos, numas terras baldias e pantanosas do Baixo Vouga, na vertente oeste da montanha agreste do Caramulo. Tiveram três filhos, duas meninas e um rapaz, antes da nossa Avó Maria morrer, com a doença naquele tempo mortal, da “tuberculose”, que mais tarde também viria a vitimar uma das suas filhas. O Avô Geraldo, sem a companhia da esposa Maria, sem recursos, vendo que não podia alimentar, vestir e educar os seus filhos, pensando que mais cedo ou mais tarde iam também acabar por morrer, entrega-os a algumas famílias mais abastadas na região, entrando num qualquer navio que atracou em Portugal e, seguiu como “pioneiro”, (dizia o Pai António, que o nosso Avô Geraldo, foi para as Áfricas)!. Por muitos anos, já nós éramos criança e, sempre que o correio parava no Vale do Ninho D’Águia, que era a aldeia onde viviamos, o Pai António dizia: “vai lá ver, deve ser carta do Avô Geraldo”!. Mas não era, o Avô Geraldo, nunca mais deu notícias!. (they met in a village, still in Spain, in one of these refugee camps and, walking from village to village, along the road to San Tiago, came to Portugal and, enjoying each other, married, where they lived for some years, and swamps of Baixo Vouga, on the western slope of the rugged mountain of Caramulo. They had three children, two girls and a boy, before our Grandmother Maria died, with the disease in that mortal time, of “tuberculosis”, which would later also victimize one of her daughters. Grandfather Geraldo, without the company of his wife Maria, who could not afford to feed, clothe and educate his children, thinking that sooner or later they would also die, and gave them to some of the wealthiest families in the region, entering a ship that landed in Portugal and followed as a “pioneer” (said Father Antonio, that our Grandfather Geraldo, went to Africa)! 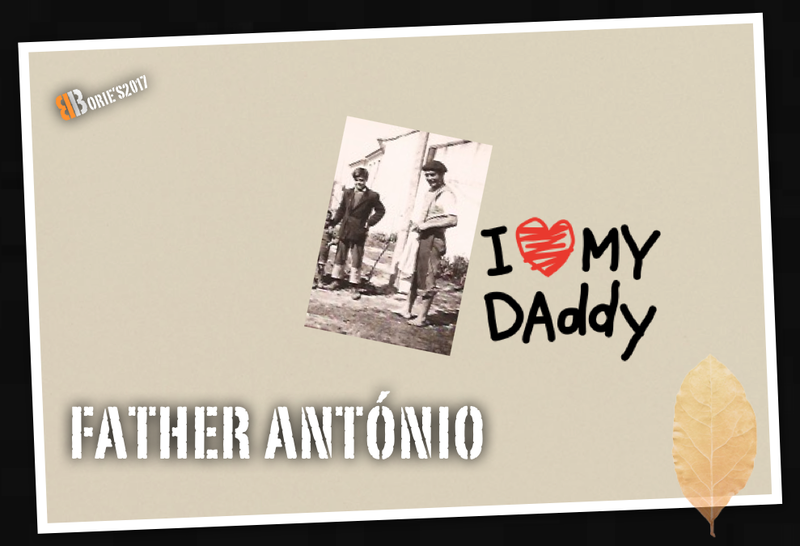 For many years, we were already a child, and whenever the mail stopped at Vale do Ninho D’Águia, which was the village where we lived, Father Antonio said: “Go and see, it must be a letter from Grandfather Geraldo!” But it was not, Grandfather Geraldo, he never heard! …o Pai António, foi entregue a uma família, que tinha um negócio de taverna, onde também serviam comida, fazendo dele um escravo, trabalhava de dia e de noite, servindo, limpando, fazendo os serviços mais sujos, ajudando a alimentar os animais, junto do local onde dormia algumas horas, animais esses que ajudava a matar, para consumo na taverna, era espancado por toda a família, que viam nele um estranho e para mais abandonado, alimentava-se dos restos, quando os havia e, nunca frequentou a escola!. Mais crescido, revoltado, quase vivia na rua, ajudava quem lhe desse alguma roupa ou comida!. Foi numa dessas ocasiões que, ajudando em alguns serviços pesados, numa pensão, onde também trabalhava a nossa Mãe Ilda, se conheceram!. 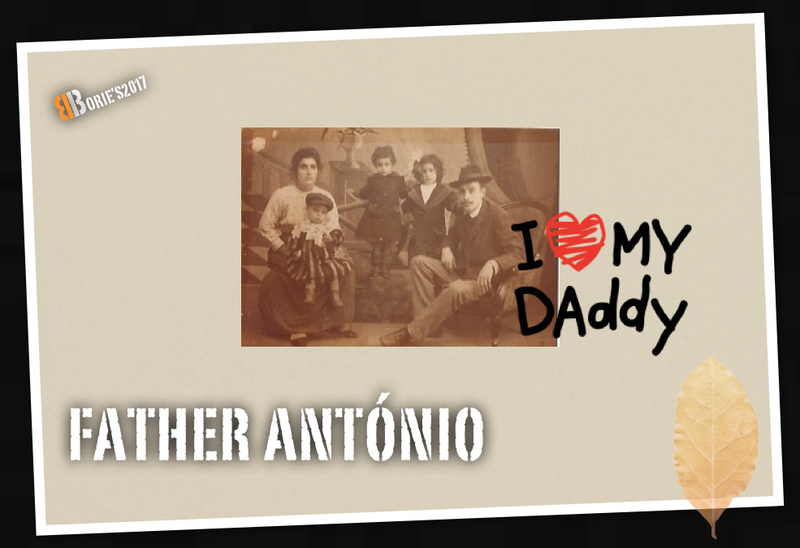 (Father Antonio, was given to a family, who had a tavern business, where they also served food, making him a slave, working night and day, serving, cleaning, doing the most dirty services, helping to feed the animals, a place where he slept a few hours, which he helped kill, for consumption in the tavern, was beaten by the whole family, who saw in him a stranger and for the most abandoned, fed on the remains, when he had them, and never attended the school!. More grown up, revolted, almost lived in the street, it helped who gave him some clothes or food !. It was on one of those occasions that, helping in some heavy services, in a pension, where our Mother Ilda also worked, they met)!. …e assim ela, a Mãe Ilda, com um vestido emprestado por alguma senhora caridosa, ele, o Pai António, com umas calças, com alguns remendos, já curtas e velhas, onde se faziam ver umas botas usadas que um militar lhe ofereceu, sem meias, uma camisa, com as mangas um pouco arregaçadas, pois também eram curtas, não chegavam ao fim dos seus braços, mas ambos com um sorriso de felicidade nos lábios, apareceram em frente ao senhor padre Rachão, que por sinal era padre, mas pai de uma filha, que lhes leu a epístola, fazendo-os marido e mulher, perante Deus e os homens, para o resto das suas vidas!. (and so she, Mother Ilda, with a dress borrowed by some charitable lady, he, Father Antonio, in some trousers, with some patches, already short and old, where one could see used boots that a soldier offered him, without socks, and a shirt, their sleeves a little flat, for they were short, they did not reach the end of their arms, but both with a smile of happiness on their lips appeared in front of Father Rachão, who by the way was a priest, but father of a daughter, who read them the epistle, making them husband and wife, to God and to men, for the rest of their lives)!. …o Pai António, era um homem trabalhor, cultivava algumas leiras de terra, ajudava os vizinhos, era uma pessoa com bons sentimentos, mas não sabia dar carinho nem ouvir ninguém, pelo menos não o demonstrava, era uma pessoa que sofreu, porque também nunca recebeu qualquer gesto carinhoso, a sua juventude tinha sido muito difícil, tinha sido uma juventude de luta, sobrevivência e discriminação constante. 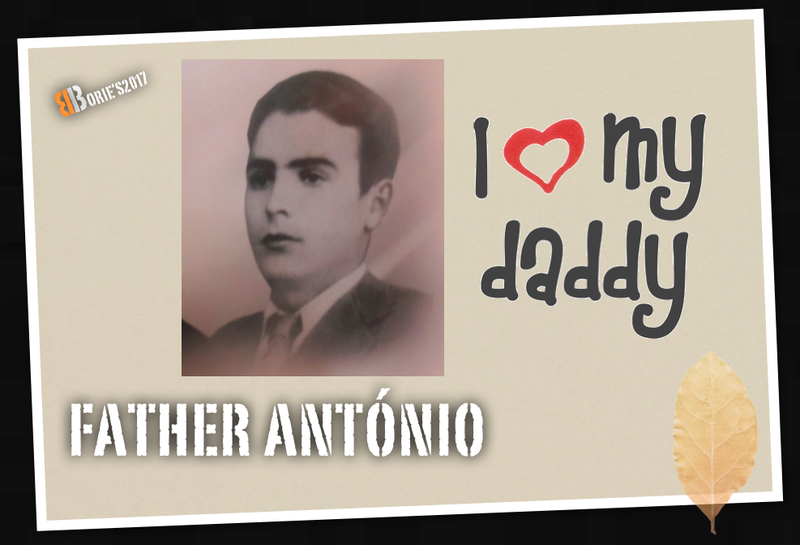 O Pai António, nunca teve boas relações com a Avó Agar, havia ciúmes, porque talvez, ambos adoravam a Mãe Ilda!. Não sabia ler nem escrever, mas sabia que existiam quatro pipas, num cabanal que existia ao fundo dos casebres onde vivíamos, eram quatro, assim como duas enxadas, dois porcos, quinze coelhos, doze galinhas e frangos, sabia contar, mas não sabia desenhar os números!. 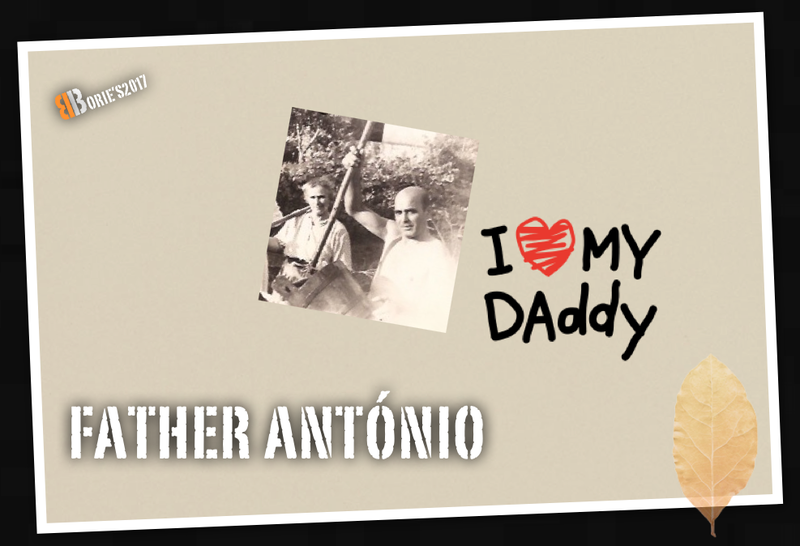 (Father Antonio, was a hardworking man, he cultivated a few acres of land, he helped the neighbors, he was a person with good feelings, but he did not know how to give affection or hear anyone, at least he did not show it, he was a person who suffered, received any kind gesture, his youth had been very difficult, had been a youth fighting, survival and constant discrimination. Father Antonio, never had good relations with Grandma Agar, was jealous, because perhaps they both worshiped Mother Ilda!. I could not read or write, but I knew that there were four kites, in a hut that existed in the back of the huts where we lived, there were four, like two hoes, two pigs, fifteen rabbits, twelve chickens and chickens, he knew how to count, but he could not draw the numbers)!. …era raro, mas de vez em quando, parava junto de nós, tocáva-nos na cabeça, olháva-nos, queria dizer qualquer coisa, não dizia e, apareciam lágrimas nos seus olhos, talvez não soubesse exprimir-se, talvez a sua juventude o fizesse ter um pensamento diferente do que é a família, mas sempre trabalhou para nós e, fez com que não nos faltasse, pelo menos uma refeição por dia!. (it was rare, but every now and then he would stop by us, touch us on the head, look at us, he would say anything, he would not say, and tears would appear in his eyes, perhaps he could not express himself, perhaps his youth it made him have a different thought than the family, but it always worked for us and made us miss at least one meal a day)!. …a nosso convite, vieram ver-nos aqui nos USA, com a Mãe Ilda. Como homem com uma “juventude cruel, de abandono de rua”, habituado a sobreviver, sabia tudo, que ali era Nova Yorque, os taxis eram amarelos, o Empire State Building, era o mais alto, talvez tivesse visto as imagens na televisão!. Depois de aqui estar uns meses, ver o que mais gostava, pediu-nos para regressar para junto da sua aldeia, que estava desejoso de voltar a ver!. (to our invitation, came to see us here in the USA, with Mother Ilda. As a man with a “ruthless, street-dwelling youth”, accustomed to surviving, he knew everything, that it was New York, taxis were yellow, the Empire State Building was the tallest, he might have seen the pictures on television!. After being here for a few months, seeing what he liked best, asked us to return to his village, which he was looking forward to seeing again)!. …quando já doente, pois morreu com a doença de câncer, fomos vê-lo a Portugal, mais uma vez nos pediu para dele nos aproximar-mos, tocou-nos na cabeça e falou, baixinho, pois não tinha forças para falar alto e, disse: “lembras-te, quando eu saía da mesa um pouco antes de vocês acabarem de comer?. Não era porque não tivesse fome, era que via que o comer não ia chegar para todos”!. (when he was already ill, for he died of cancer, we went to see him in Portugal, he again asked us to approach him, he touched our heads, and he spoke softly, for he did not have the strength to speak loudly, said, “Do you remember when I left the table a little before you finished eating? It was not because I was not hungry, I saw that eating was not going to reach everyone”)!. …sim, lembro-me ainda hoje Pai António e, também me lembro daquele “carrinho” que me fizeste, que não era mais do que um pau, com uma roda de madeira na ponta, que eu levava quando ia atrás de ti, quando ias descalço, trabalhar nas terras alagadiças do lameiro, tu também não me sais do pensamento, descansa em paz e, até qualquer dia Pai António!. (Yes, I still remember Father Antonio, I also remember that “cart” you made me, which was no more than a stick, with a wooden wheel on the end, which I carried when I went behind you, when you went barefoot, working in the marshy lands of the mire, and you also do not leave me of the thought, rest in peace and, until one day, Father Antonio)!. 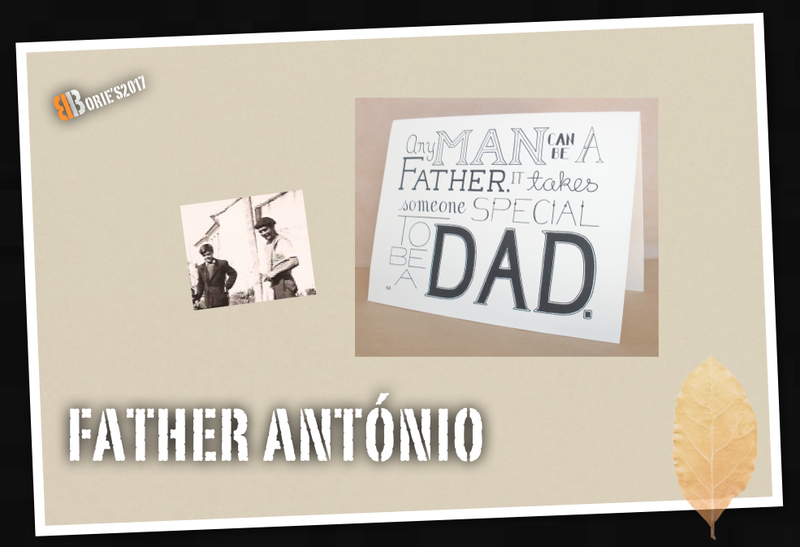 This entry was tagged the father Antonio. Bookmark the permalink.